Cheap hotels located on Las Vegas Strip? It's possible! While generally it's not very cheap to stay in a popular touristy area, some Las Vegas hotels are nice to your wallet and offer very good deals. Here are some of the cheapest, great value hotels located right on the Strip in Vegas, all boasting fun Casinos, restaurants and top-notch entertainment. Harrah's is a classy, energetic cheap hotels on Las Vegas Strip that doesn't pretend to be something else. Country music formed the hotel's cozy atmosphere, and the familiar smell of juicy steaks and hot burgers fill the air around the dining places. KGB (really Kerry's Gourmet Burgers) restaurant stands out with Russian-themed interior and a crazy combination of vodka and burgers. Hotel's live entertainment is based on the first-class comedy shows such as Broadway-inspired Defending the Caveman, and lounge acts. Open-air Carnaval Court Bar & Grill serves the visitors with delicious food, creative cocktails prepared by charming flair bartenders, and endless music from favourite live bands and DJs. Blackjack tables allow visitors to gamble while taking breaks from dancing. Real gambling fans will head to the Harrah's Casino to enjoy the ultimate excitement of the place. 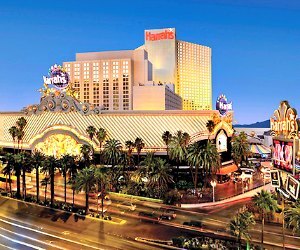 Harrah's hotel is located right in the heart of the Strip, offering numerous attractions just around the corner, such as a world-famous Madame Tussaud's museum. Unique and memorable, Stratosphere Hotel brings the most exciting experiences to its patrons. The main attraction of this cheap hotels on Las Vegas Strip is the Stratosphere Tower, the tallest structure in Las Vegas, which is a must-visit place for tourists. 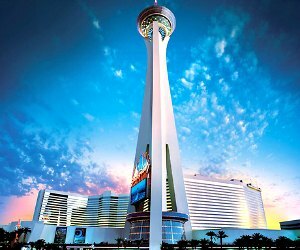 The 1,149 ft. (350.2 m) tall tower offers the 360 degrees, bird-eye view of the Sin City. Romantic couples feel like in heaven, having an unforgettable dinner at the rotating Top of the World restaurant. Extreme fans admire the tower for its adrenalin-filled rides, especially the Big Shot - the world's highest thrill ride ever! The bravest daredevils try the bungee-like SkyJump Las Vegas, the fastest way to get down from the 108th storey. Adrenalin dose is followed by a generous meal and relaxing shopping at the Tower Shops. Fortune seekers stop at the Stratosphere Casino right at the bottom of the tower to play roulette, poker and slot machines. Refreshing pool and spa salons are preparing guests for the next day of adventures in Las Vegas. Surprisingly cheap for the central Strip location, The Linq Hotel & Casino (formerly known as The Quad and Imperial Palace) is a veteran cheap hotels on Las Vegas Strip. It suits young and easy party-goers who return to the hotel just to refill energies for the next night on the Strip. Those who expect a home-like comfort and spotless bathrooms - better look somewhere else. 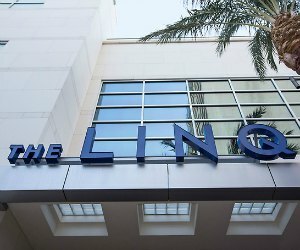 The Linq Hotel offers a variety of suites with standard amenities to meet everyone's needs. During your stay check the hotel's Auto Collections, the world's largest classic car museum featuring antique, celebrity and historic cars. Continue with the Divas Las Vegas show with incredible acts by drag artists, hosted by one of the Strip's most popular performers Frank Marino, an impersonator of legendary Joan Rivers. Young entertainer Jeff Civillico presents an interactive comedy night called Comedy In Action with a family-friendly jokes and stunts. The main attraction of The Linq is new ferris wheel known as High Roller located at the new promenade area. If that's not enough, the Caesar's Place and tens of other Strip's hot spots are just around the corner. Famous mainly because of its pocket-friendly Casino Royale with low table minimums and great odds, the Best Western hotel also offers great accommodations in the centre of the Strip. The hotel is hiding behind a row of blue dwarf townhouses, it has 152 rooms, free parking and seasonal outdoor pool at the desert-like patio. The newly renovated guest rooms are fresh and spacious, with eye-pleasing views and contemporary amenities. First-floor rooms facing the Strip can be noisy as expected in the very heart of Vegas. The best shopping malls, city's landmarks and popular nightclubs are at the walking distance. Mirage is right across the street, Caesar's Palace and Venetian are around the corner, and the entertainment options for the Best Western guests are endless. 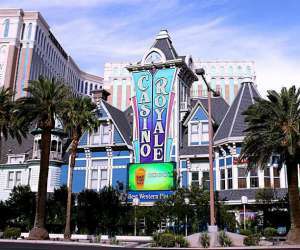 Great combination of the affordable price, prime location and enjoyable gambling experience, the Best Western & Casino Royale is among the best choices for tourists looking for cheap hotels on Las Vegas Strip. 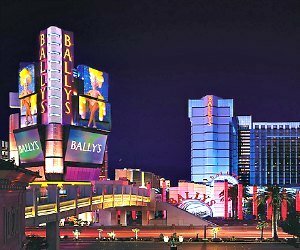 Bally's Las Vegas surprises its guests with diversity of entertainment options, upscale suite interior and convenient central location on the Strip - and yet Bally's is among cheap hotels on Las Vegas Strip with very affordable prices. Three hotel's towers have more than 2,800 suites to choose from. The guestrooms are very spacious with ceiling-to-floor panoramic windows that give a breathtaking view of the Sin City. In addition to the Strip's attractions everywhere around you, Bally's has few "secret weapons" to entertain its guests. This cheap Las Vegas hotel's classic casino provides the ultimate Sin City gambling experience with a wide range of table games, poker, slot machines and a book room. For relaxation visit Bally's Las Vegas Spa to enjoy massages and facial treatments, or catch some suntan at the sparkling Blu Pool. When you're ready for some adventure, Las Vegas Monorail will take you to any spot at the Strip!